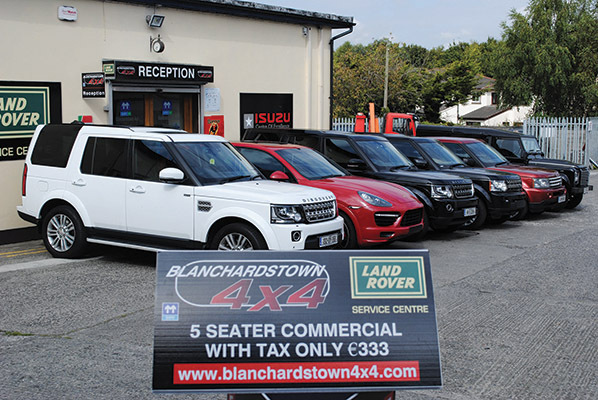 Specialising in the sale, service and maintenance of luxury commercial vehicles and light commercials, Blanchardstown 4x4 is also a main Isuzu and LDV dealer. We caught up with Robert Dempsey to find out more about this exceptional family business, which he established alongside his father, Pat, in 2000. Think commercial vehicles; think Blanchardstown 4x4. With nationwide reach and, indeed, catering to a global market, the Dublin 15 based, family-run business is known far and wide for its excellence in all things pertaining to 4x4s and light commercials. Proprietors / directors Pat and Robert Dempsey are the driving forces behind the business. The father-and-son team make for a winning combination, each possessing boundless energy, passion, experience and enthusiasm for 4x4s and light commercial vehicles, a market in which they have become recognised leaders at home and abroad! A full range of services in provided, including sales, service, maintenance, conversions and repairs. Through its thorough professionalism and dependability, the company has carved a unique niche for itself in the nation’s collective consciousness over the past 15 years. “Myself and Pat started it off in 2000,” reflects Robert, in between taking a few phone calls from customers (they always come first!). “My dad is 72 now and has been in the motor business for over 50 years, having worked for ‘Pino’ Harris for 30 of those. “Commercials and 4x4s are our bread and butter and we have the main dealerships for both Isuzu and LDV.” The new Isuzu D-Max is proving especially popular, while the entire range of smaller trucks is also stocked, complemented by a complete parts and back-up service. The international market was tapped into in response to the economic downturn. “During the recession we started to export to Africa, Australia, the UK, Thailand, and anywhere where there was right-hand drive,” Robert notes. “We found our way into the world market for second-hand Range Rovers, jeeps and high-end cars. From their state-of-the-art, SIMI-registered garage, Blanchardstown 4x4 offer a full service on all makes of 4x4s and light commercials. Each service is carried out according to manufacturer specifications and all work is guaranteed. Professional commercial conversions are completed on-site to the highest standard, including vehicle registration and number plate fitting. The range of services provided includes full service, dealer-level advanced engine diagnostics, crash repairs, 24/7 breakdown recovery, tyre sales and fitting, oil changes and battery replacement, engine performance and repair, while Blanchardstown 4x4 are also specialists in electrical/electronic, steering and suspension, safety, heating, air-conditioning and exhaust systems. Although they have only recently taken on the dealership, Blanchardstown 4x4 have already established themselves as Ireland’s largest seller of LDV vans. “We have a new greenfield site bought and we will move into new premises a ten-minute drive from our current base in about 18 months,” Robert reveals. At present, gainful employment is generated for a team of eleven, including three in the workshop and two in sales. With a magnificent range of 4x4s and light commercial vehicles; a full range of back-up services; the best commercial vehicle garage staff in the country; and knowledgeable, customer-focussed directors in Pat and Robert Dempsey, is it any wonder that Blanchardstown 4x4 is widely recognised as the best in their chosen business?